Utah's Best Pizza . . . Period. Z Brothers Pizza specializes in fast, free delivery to most all of South Davis County. We are a casual, family-friendly restaurant located in both Centerville and North Salt Lake, Utah. Both locations have a lobby big enough to seat even the largest of families. 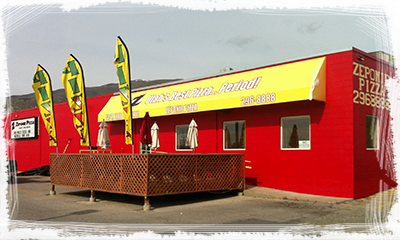 At our Centerville location, we also seat on our deck which looks west towards the Great Salt Lake. We are locally owned, community-minded and extremely proud of our product. Our delivery area stretches from North Salt Lake to 600 North in Farmington. Next time you head out for a bite or pick up the phone to order in, give Z Brothers Pizza a try. You’ll be glad you did. Monday Buy a Large Specialty Pizza at regular price, get a Medium 1-Topping Pizza for $6. Tuesday Buy a Large Pizza at regular price, get a 2nd Large Pizza for half price. Wednesday Buy a Medium Pizza at regular price, get a 2nd Medium Pizza for half price. Friday Any Large Pizza on the Menu: $17.99 1st; $16.99 2nd (2nd Optional). Saturday Get 2 Large 2-Topping Pizzas for only $29.99. Daily Specials cannot be combined with any other offer.